Have you ever thought of owning a serene, tropical island? No modern buildings, houses, or roads? No disco music, no movies, pollution, no noise? Just you, a shore of fine sand, and the vast sea serenaded by the cries of seagulls and the crash of waves on the shore? Well, you can definitely have that wish come true! And you don’t have to spend millions for living in that paradise. The only catch is, you can only own that “isla paradiso” for at most, a couple of hours. So where can you find this place where you can temporarily own an island? In San Agustin, Surigao del Sur, of course! 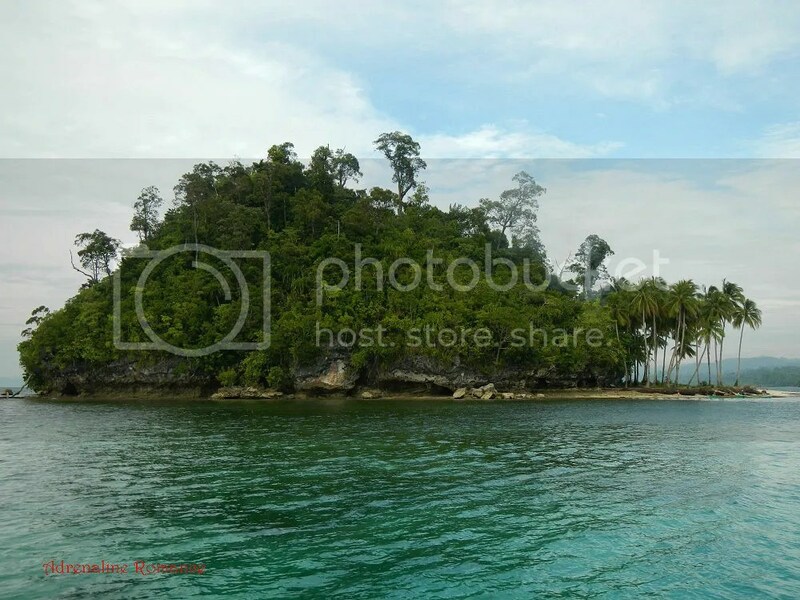 Nestled in this quiet municipality is the lovely Britania Group of Islands, a group of 24 small islands embraced by the Lianga Bay. But technically, they are uninhabited islets, promontories, outcroppings, and sandbars. These small masses of land contain pockets or no vegetation at all but are encompassed with aquamarine water teeming with life. Many of these islands feature carpets of fine-golden brown sand. From Cagwait, we boarded a bus (standing in the aisle for half an hour, mind you) that was headed back to San Agustin. After an hour on the road, we reached Salvacion where we disembarked and rode a habal-habal to our next temporary home, the La Entrada Resort and Restaurant. We reached La Entrada in less than 15 minutes. After spending many hours on the road, the welcome sight of this beautiful beach resort was a relief to the body and spirit. Yes, we were extremely happy with our road trip, but sometimes, the body is not just willing to go on, right? Surrounded by a carefully manicured garden, this humble resort’s facade is a delight to the eyes, promising a pleasant and comfortable stay. Check out that cute wishing well and the plant box cleverly made from an old dugout boat. Nice! After registering, we went to our room so we can freshen up before eating dinner. Our room is located in a forest of mangroves. 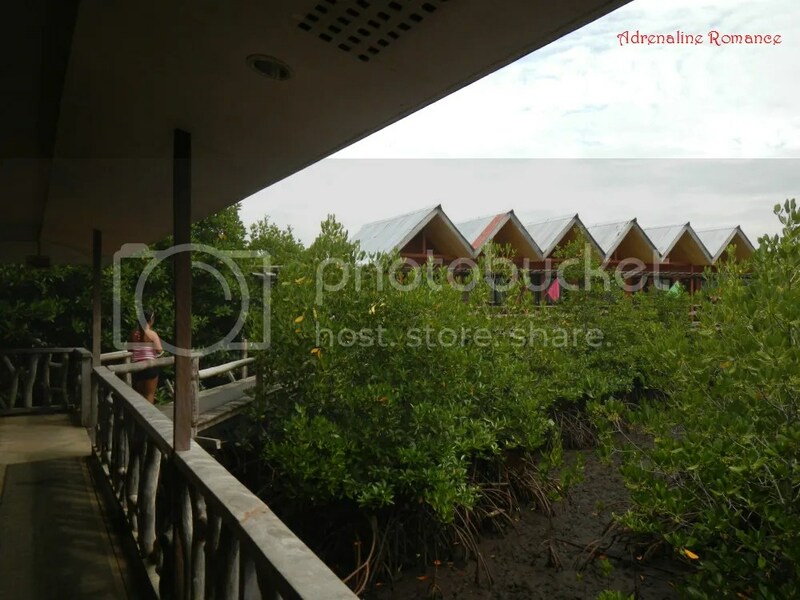 To minimize damage to the area, the resorts rooms are built on stilts over the mangroves. Wow! Awww, isn’t that lovely? We have love swans in our room! Hehe! 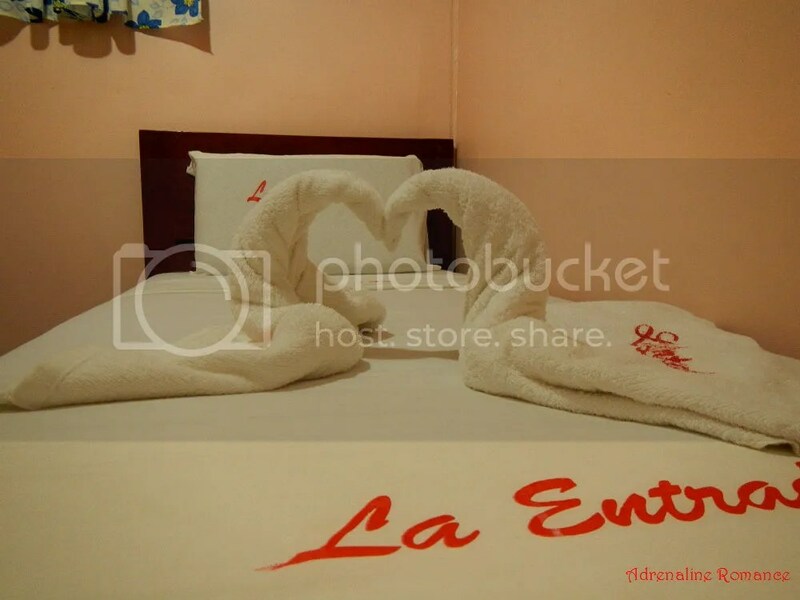 La Entrada Resort’s cheapest rooms are definitely simple but utterly comfortable. 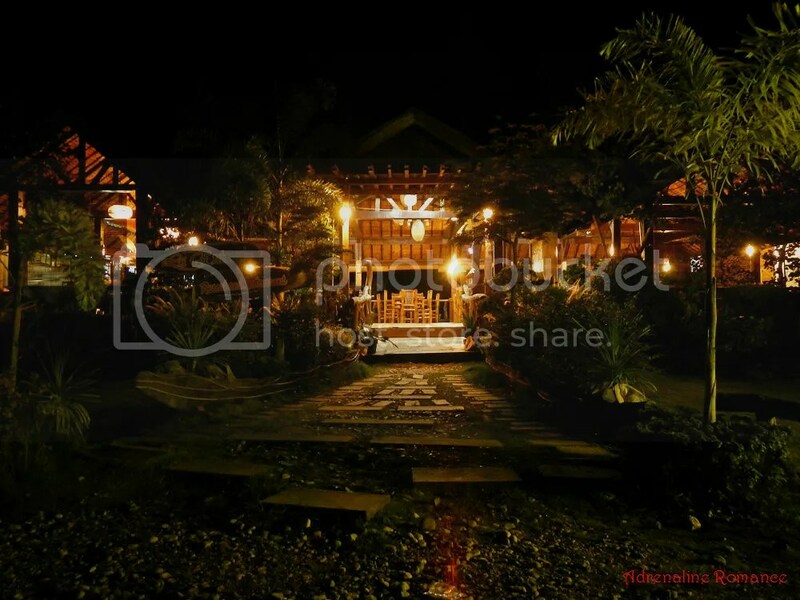 La Entrada Resort’s true beauty glows at night when its lights come out. That’s the restaurant and the reception area of the resort. 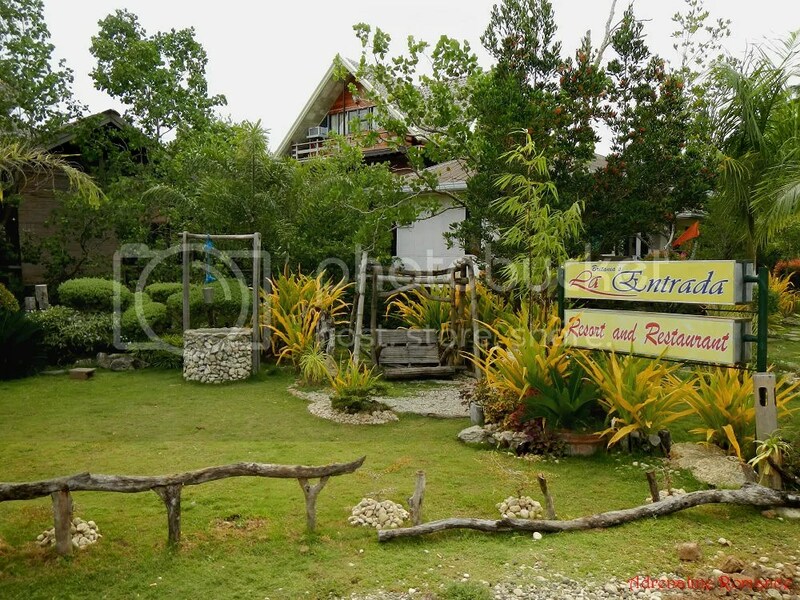 Equipped with a small bar and a large wall-mounted LCD TV, the restaurant is simple and cozy. Dinnertime! These culinary masterpieces surely tickled our palate. But best of all, the prices are very easy on the pocket. 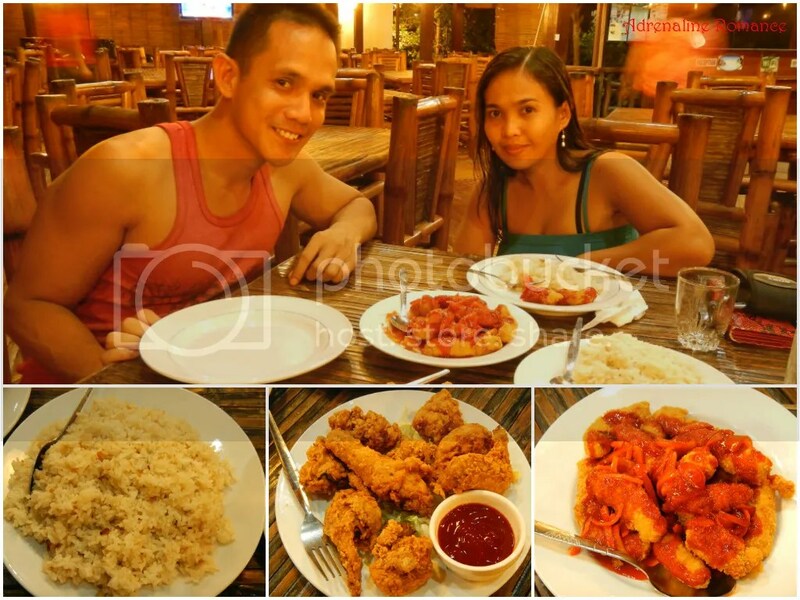 This filling dinner (we had leftovers) of garlic chicken, fish fillet, garlic rice, and Coke cost us a mere P385 pesos! Speaking of food, we were pleasantly surprised when the receptionist asked us what we wanted for breakfast. Yes, included in our payment was a hot, sumptuous breakfast. After a full and satisfying dinner, Sweetie and I went back to our room, quickly changed into our sleep clothes, flopped on the bed, and snoozed without a care in the world in less than 5 minutes. Yes, we were THAT tired. But sleeping early (around 7:30 PM) has always been a must when we travel because we don’t want to miss magnificent sunrises. Snoozing early paid off. We woke up very early in the morning to witness San Agustin’s unique, bluish sunrise. The attendant who woke up later than we did informed us that our boat was ready. 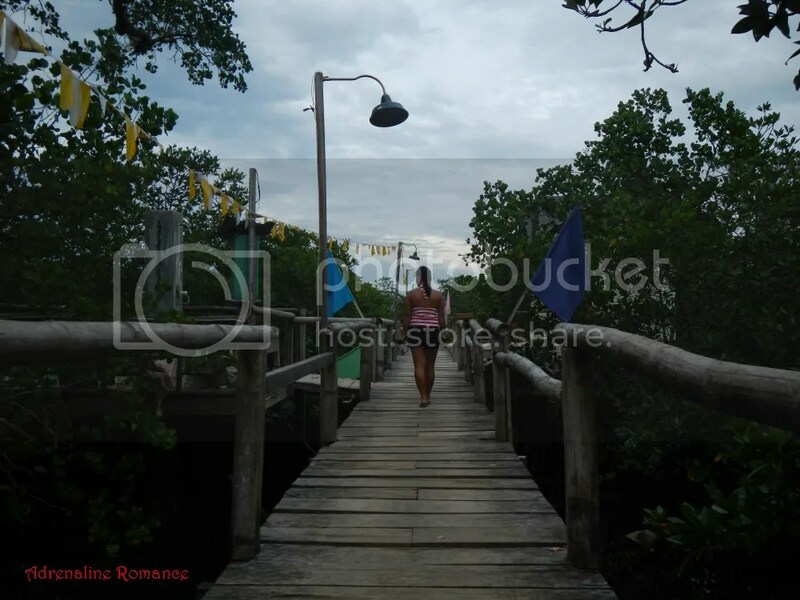 Excited for this adventure, we quickly walked up the bamboo pathway which led to the resort’s floating pier Carefully preserved mangrove forests on both sides of the pathway made the cool, dawn air even cooler. Upon reaching the floating pier, our guide, a young sun-burnt lad named Dodong, told us to wait a few minutes so they can start up their boat’s engine. No problem at all; that would give us time for a sort-of-romantic photo op. Hehe! Only the cries of seabirds hunting for breakfast, the gentle sloshing of waves under the pier, and the quiet murmur of our guides were the only sounds that emanated from the calm waters of Lianga Bay. After a little while, the banca’s engine sputtered to life, and the young guides told us to board the banca. Now, check this out: we were the only ones on board a large banca that can accommodate 30 or so people. Was there a mistake in the booking? I mean, since there were just two of us, perhaps a smaller banca was reserved for us and this is just a mix-up? When we asked Dodong if there were other tourists aside from us who will be boarding the banca, he smiled and said, “No. You’re the only ones riding our boat.” How cool is that! Folks residing in San Agustin rely heavily on the bounty of the sea for both survival and business. Thus, it was not a surprise for us to see several large fish pens like these jutting out at sea. 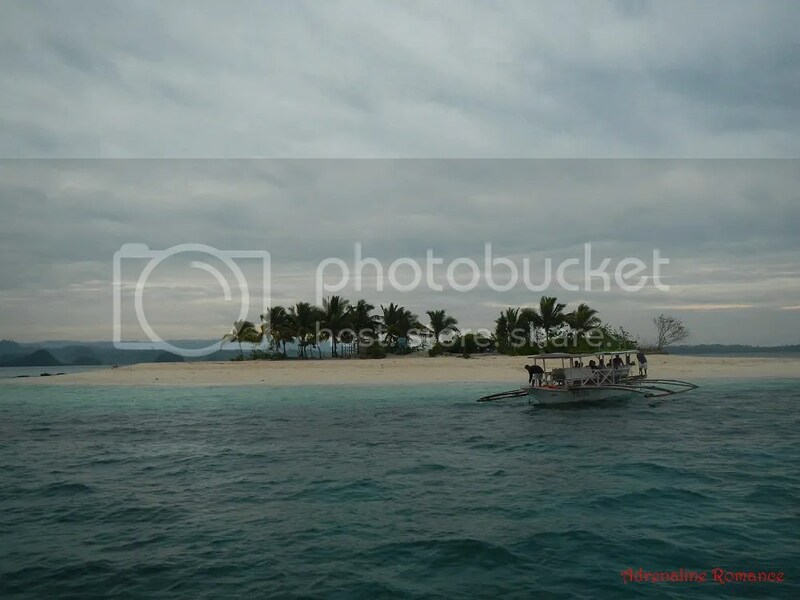 Under a cool, gray dawn, we cruised to our first destination in the Britania Group of Islands, Hagonoy Island. Each of the islands you see in the photo below—as well as all other islands in the group—has its own unique characteristic. Obviously, we won’t be able to visit all 24 islands. 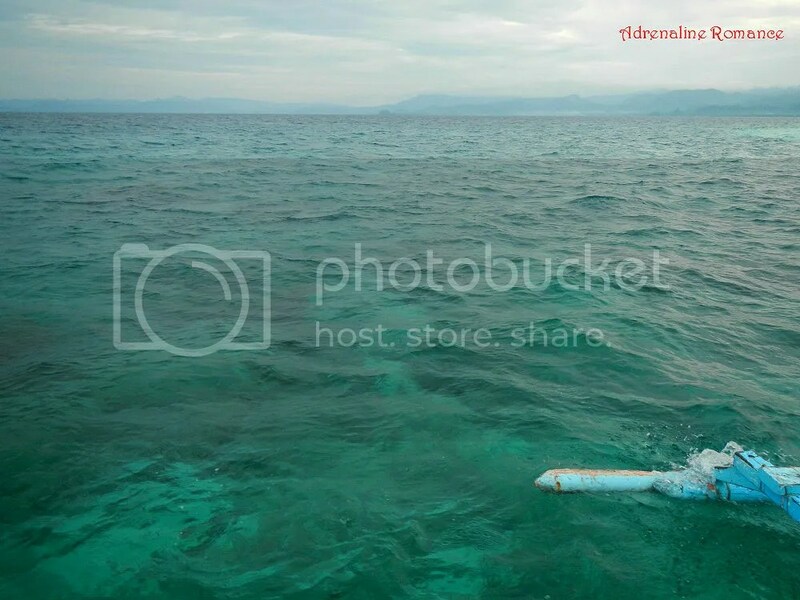 Dodong also told us that many of the islands are privately owned, thus setting foot on them would be considered trespassing. In the pre-Spanish era, this group of islands was once called Alepanto; old folks in San Agustin still use this name to refer to them and the rich fishing grounds in the bay. Look! Cupcake-shaped islands? Hehe! 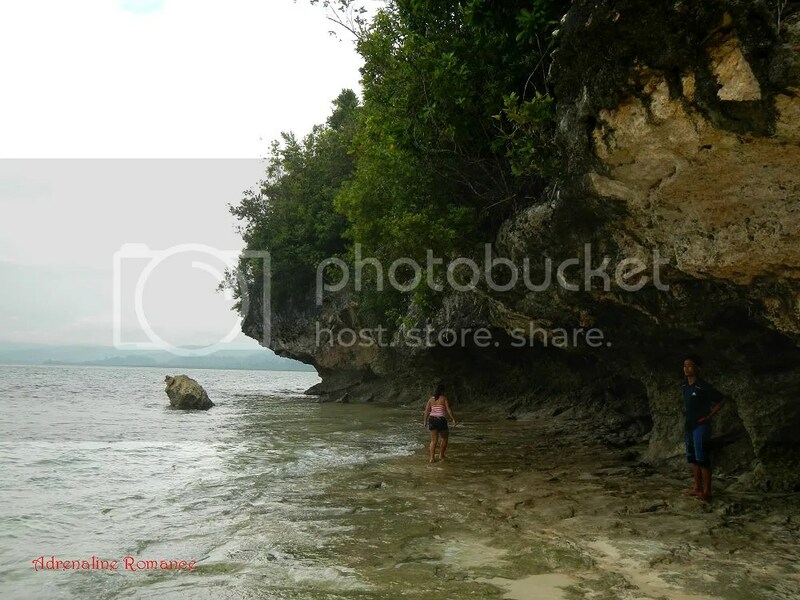 If we recall correctly, our guide identified them as Palangagan Cave Island, Palangagan Forest Island, and Isla Verde Island. Our first stop was Hagonoy Island, which is one of the farthest from the bay. As we approached the small sand-carpeted island, a group of earlier tourists departed. We have the whole island to ourselves! Excitement was overflowing to the brim. So much so that we jumped off the boat and into the sand before the boat actually docked ashore! Sweetie and I wasted no time walking barefoot on the soft sand. Check out the photo below. The shore is definitely beautiful! 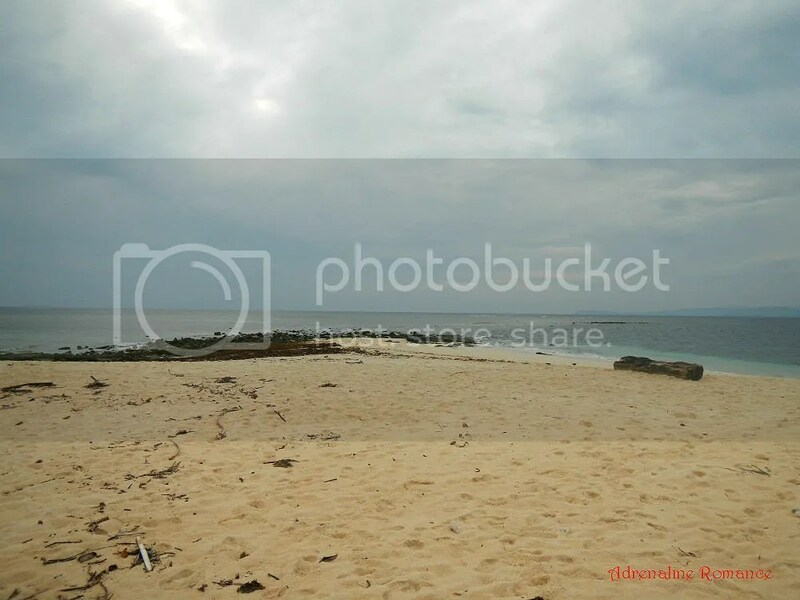 The color and the texture of the sand in Hagonoy Island reminded us of the Filipino delicacy polvoron, a type of heavy, crumbly shortbread made out of toasted flour, powdered milk and butter. 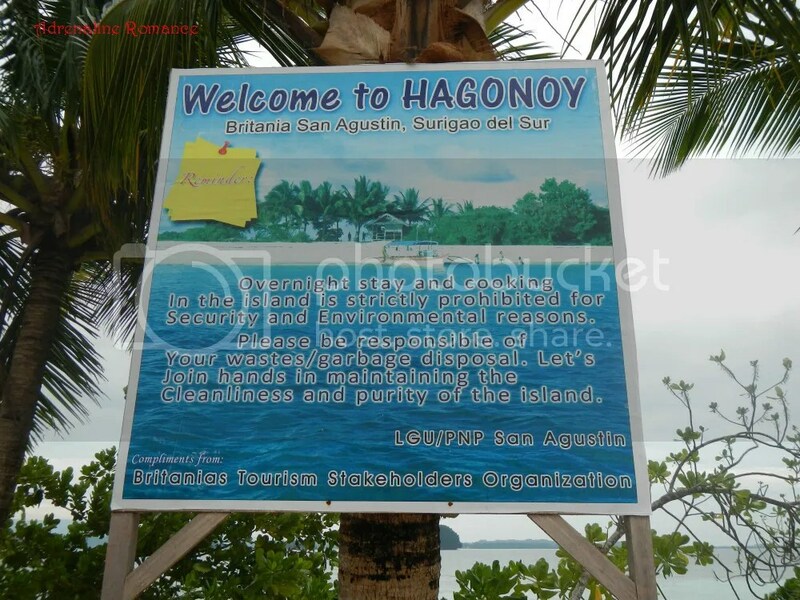 Strictly observe and follow the rules to maintain the beauty of Hagonoy Island and to ensure your safety. No cooking, no camping, and no throwing of garbage. One end of the elongated island faces the Pacific Ocean. 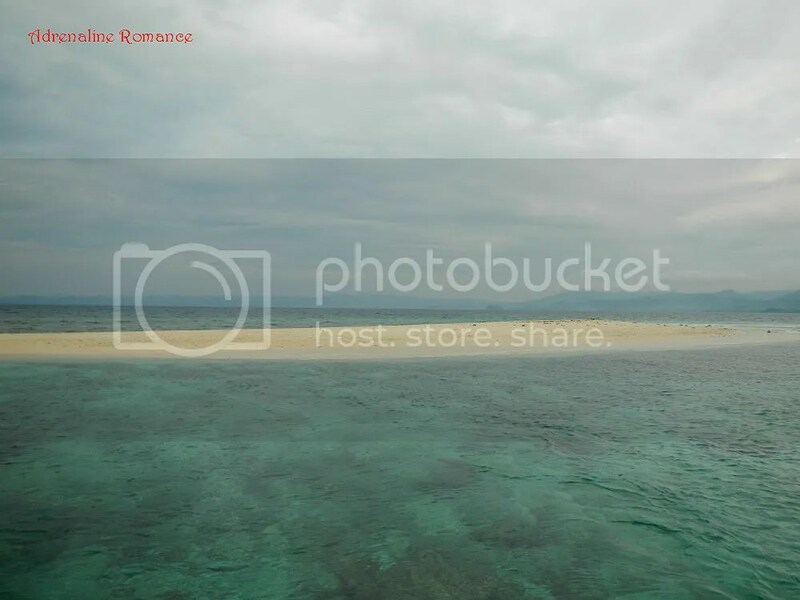 Yes, the horizon that you see in the photo below is the gate to Lianga Bay, and beyond that is the largest ocean in the world. A sparse coconut grove and a few patches of shrubs adorn the center of the island. 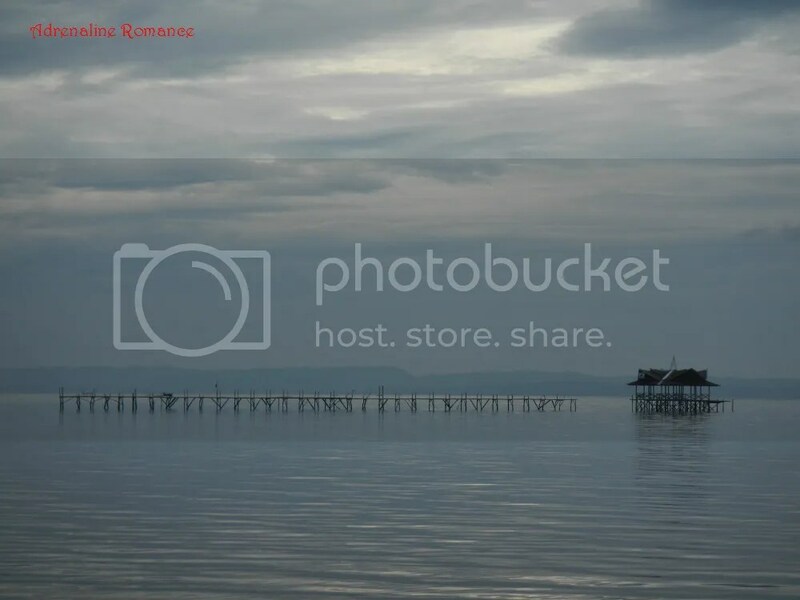 That structure you see in the photo below was once a station for Bantay Dagat personnel until it was destroyed by a typhoon. 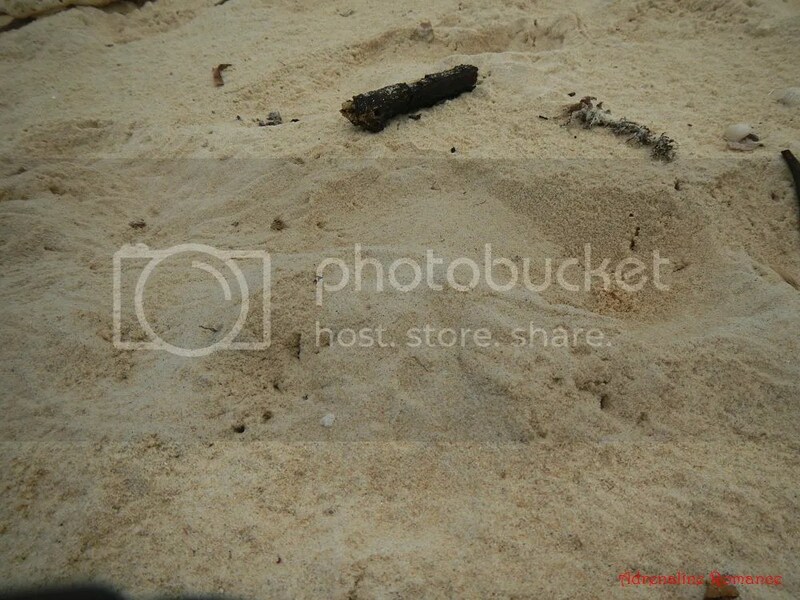 Dead sea grass are washed ashore on Hagonoy Island. During dusk and dawn, seabirds prowl here to hunt for crabs, mollusks, and other creatures of the sea. The other side of island is completely different from the sandy side where our boat docked. Almost the entire shore is made out of slabs of coral rock, which provide perfect hiding places for small sea creatures of all sorts. Those huge, flat rock slabs extend to the southern end of the island. Behind us is the rest of the Britania Group of Islands. As you can see, it is virtually impossible to visit every island in one day, even if they are all open to the public. Dodong, we figured out, is an aspiring nuptial photographer; he asked us to pose hugging and kissing each other while he took photos. We just quietly and shyly complied. We spent half an hour in the island playing the sand, swimming in the waters around it, and basically just having fun and taking photos. Then, it was time to head off to our next island. 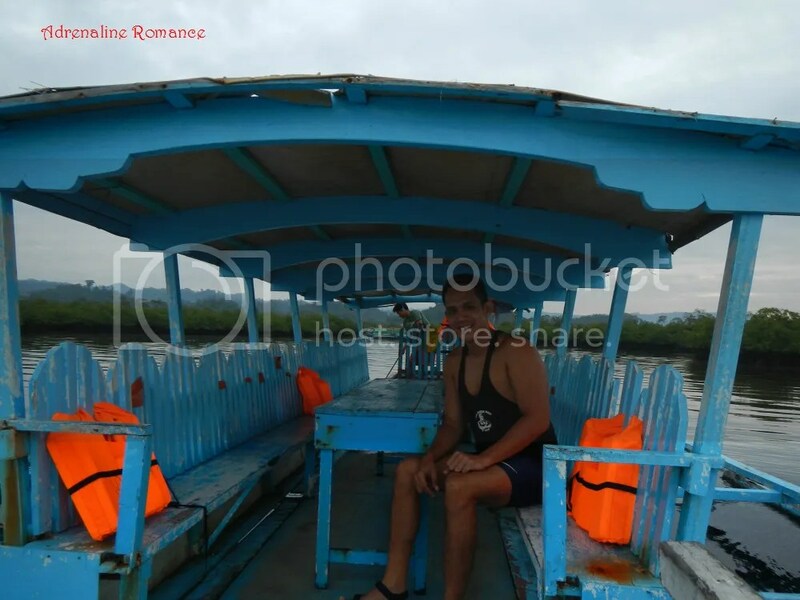 Yes, aside from the guide and the boatman, Sweetie and I were the only passengers on that humongous banca. 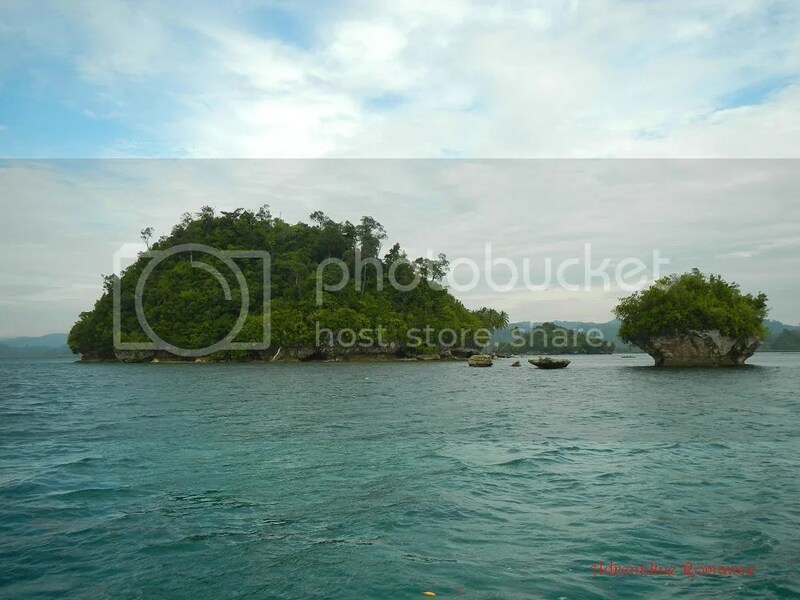 On our way to Naked Island, we bore witness to how clear and clean Lianga Bay is. 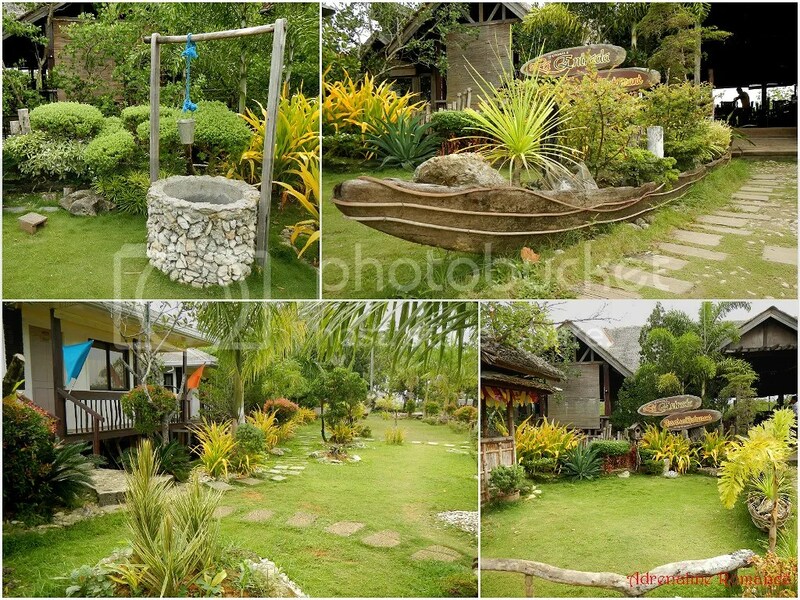 This is what we admire in rural towns; the LGUs and residents are very aware of their gifts from Mother Nature. Thus, they spend a lot of time, money, effort and discipline to carefully preserve their treasure and pride. In no time at all, we approached Naked Island. 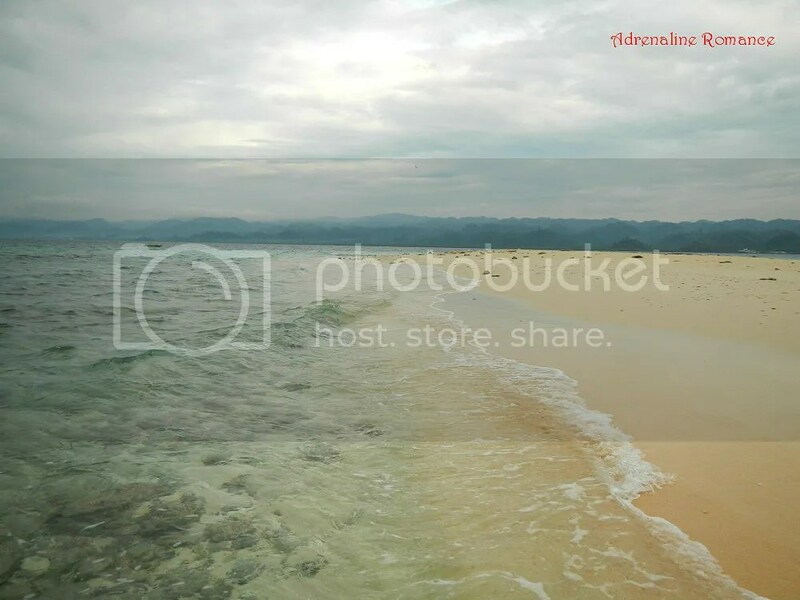 It is not technically an island but a sandbar in the middle of the sea, similar to White Island in Camiguin or Lilu Island in Honday Bay, Palawan. 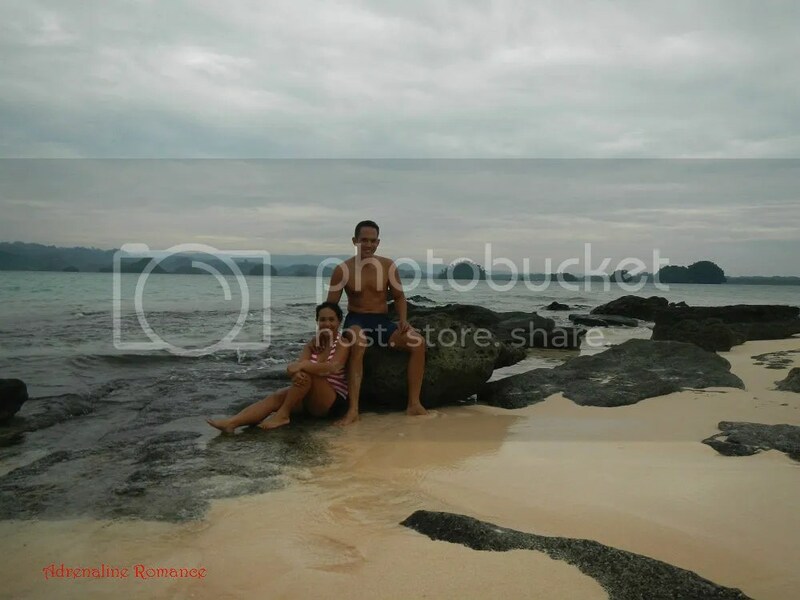 During high tide, the sandbar disappears; Dodong told us we came at the right time when the tide was still relatively low. 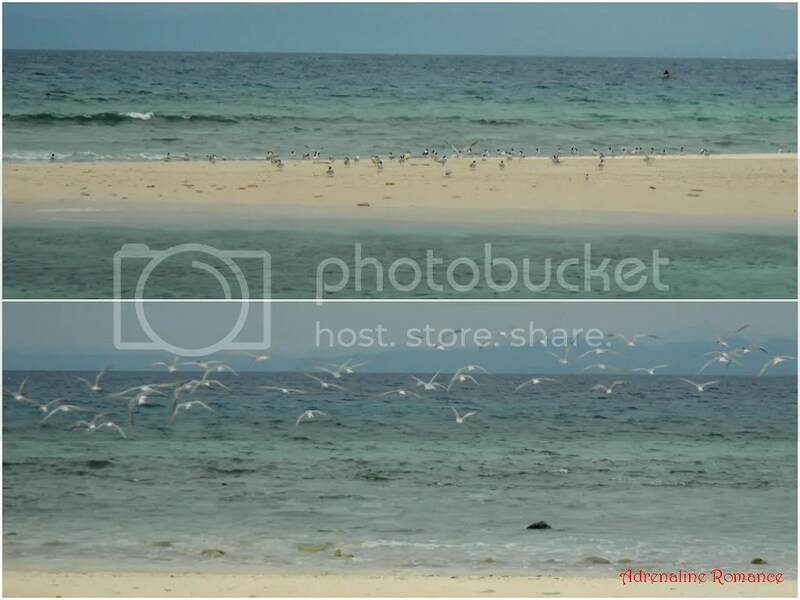 We spotted a flock of seabirds congregating at the north end of Naked Island. A bird meeting perhaps? As we approached, they heard the sound of the engines, the sound of unwanted humans. Quickly, they flew away before the bow of our banca touched the sand. 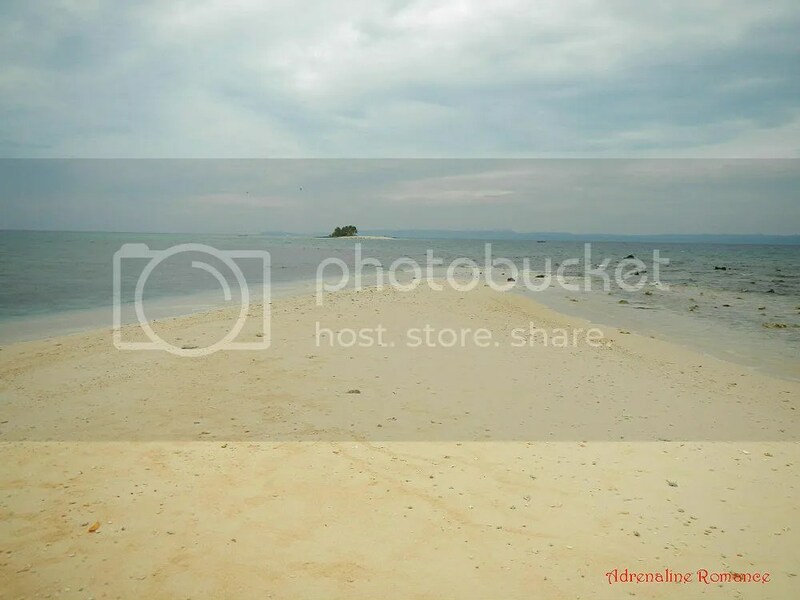 The sand in Naked Island is even finer than that of Hagonoy Island. Also, the water here was comfortably warm, quite surprising considering that the wind was a bit chilly and it was still early in the morning. Check out that view! Would you like to wake up each morning with this gentle, beautiful vista as the first thing you see? We sure do! That’s Hagonoy Island in the background. 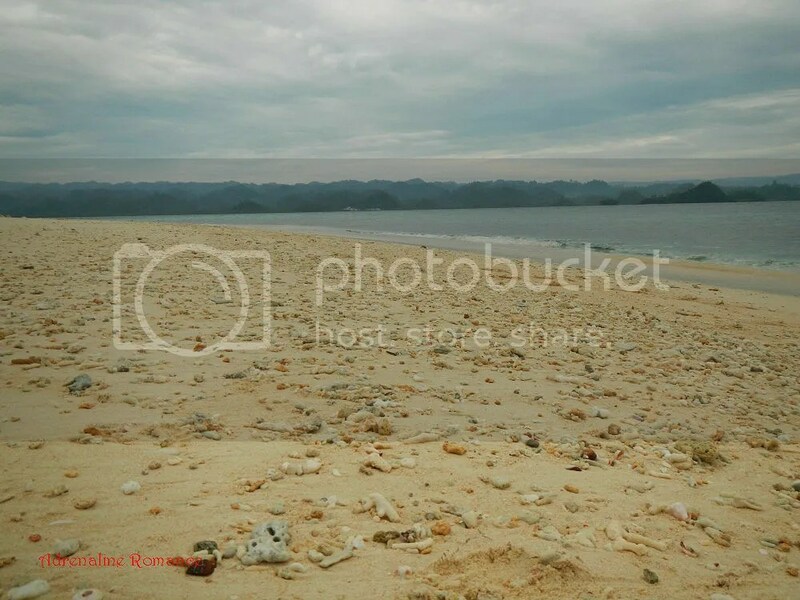 Pieces of dead corals and rocks are washed on shore. Be careful when walking on this side of Naked Island; those pieces of debris are quite sharp. We gave up our land title of Naked Island 20 minutes after we set foot on it. 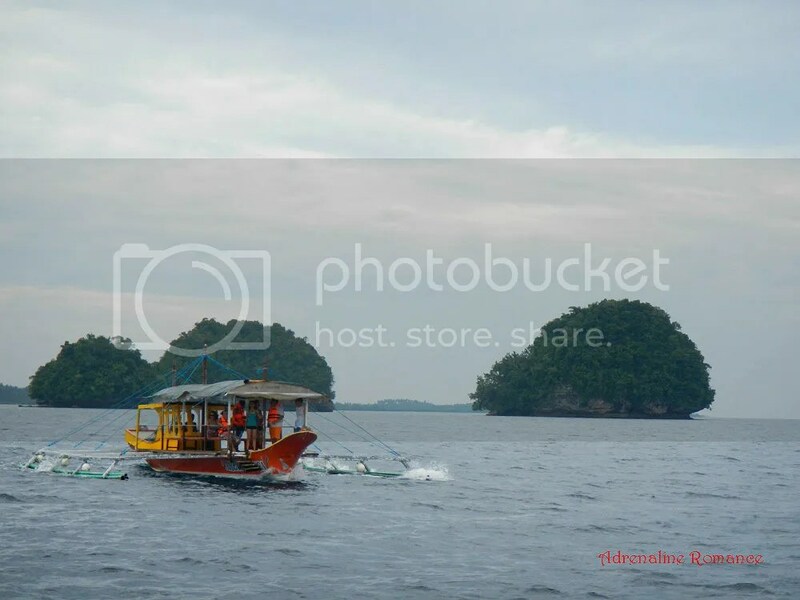 As we headed out to the next stop, we saw several boats laded with tourists cruising towards Hagonoy Island. Dodong said that we made the right decision in doing our tour early. He explained that as the day wears on, several islands of Britania will be teeming with tourists. When tourists fill in, there goes the magic and charm brought about by the islands’ isolation. Our third stop was Boslon Island, one of the largest islets in Britania and the nearest to the mainland’s shore. Being such, it is also the primary destination of visitors. Now, if you check the photo below, you will probably understand why we were really giddy with excitement as we approached the island. 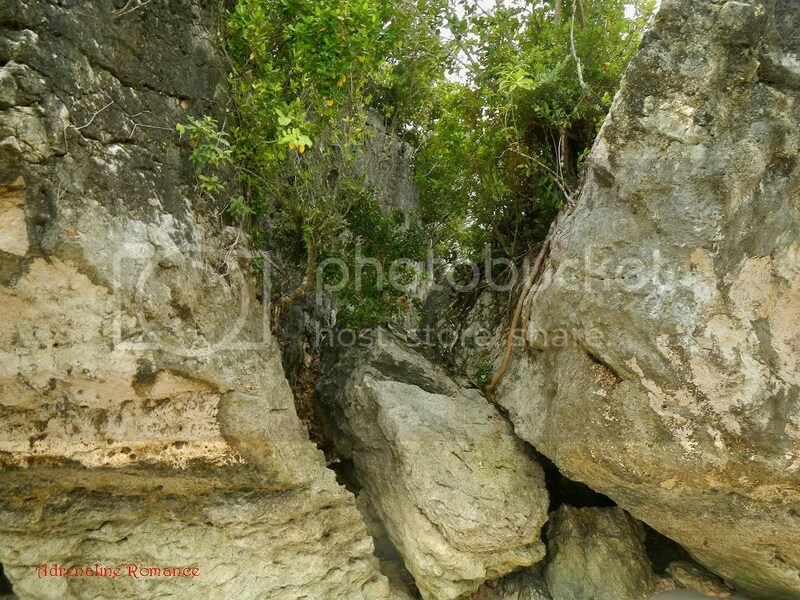 Boslon Island has a predominantly overhanging limestone rock. And if you take into consideration that we’re avid rock climbers, well, you get the idea. On top of Boslon Island’s magnificent rock table is a rich, verdant grove of light woods. Yupee! The gray clouds finally began to part, and the warm morning sun started to shine through. Sweetie found a nice shady, sandy nook to stay away from the sun’s rays. 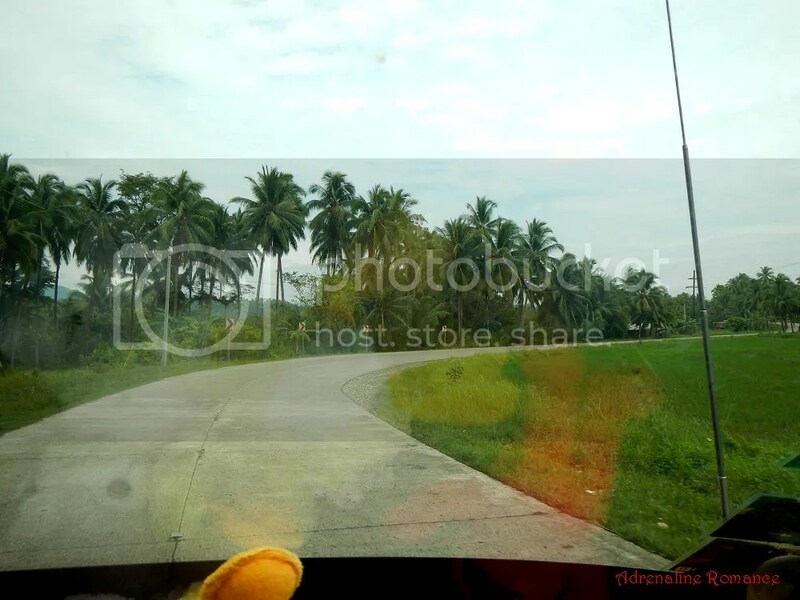 Dodong urged us to go around Boslon. 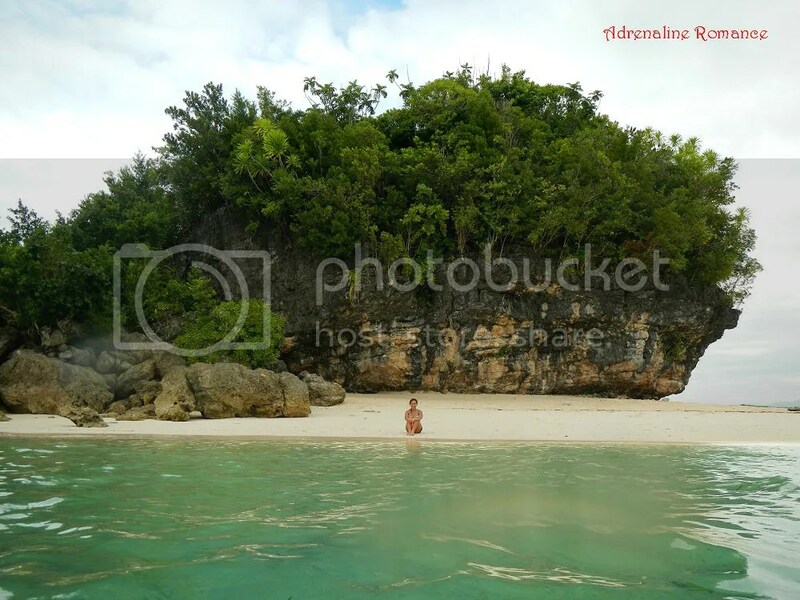 Only the “beach” end, or 30 percent, of the island is sandy; the rest comprises a shelf of rock that extends almost all around the island. 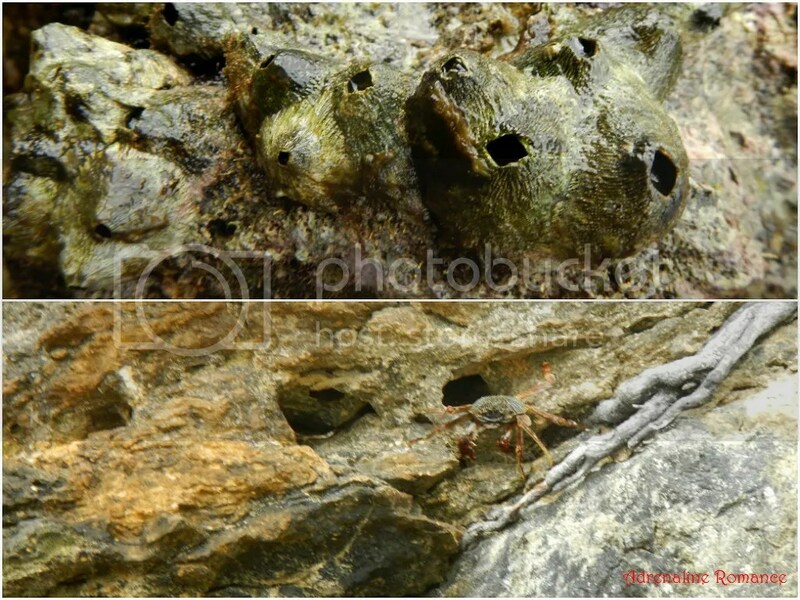 The rocky shelf provides a perfect anchor for barnacles as well as homes and hiding places for crabs. Boslon Island has secret “alleys” and nooks that make it perfect for scrambling. 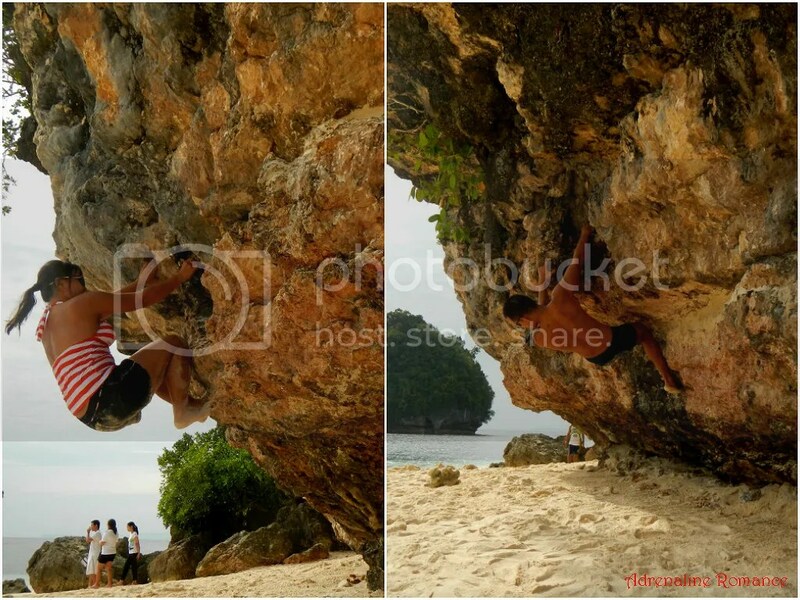 Dodong said that they have climbed to the top of several rock outcroppings when they were still children. We would have loved to try, but we didn’t bring any trekking footwear. Tsk tsk! At the beach end of the island, one can encounter this grotto. Apparently, Boslon was once a venue for pilgrims. As the sun broke out from the clouds, the glory of the Britania Group of Islands shone through. 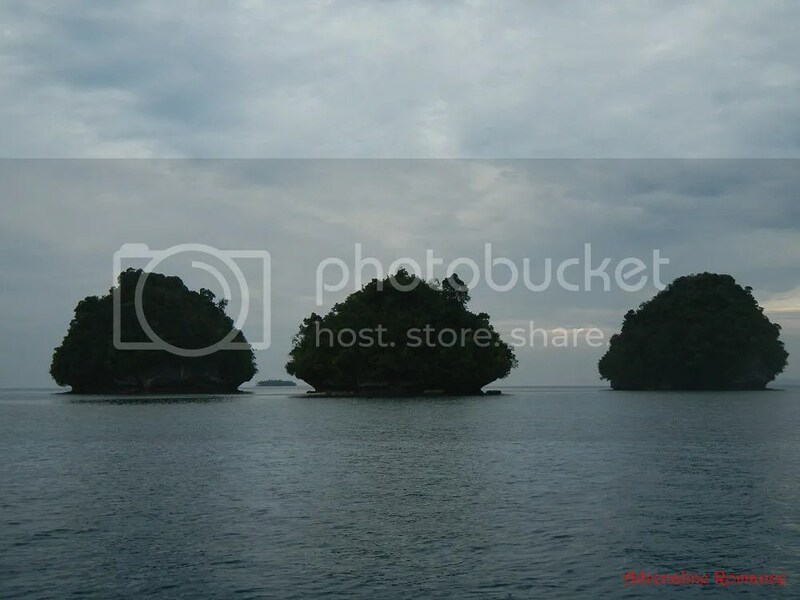 The group of islands looks like an eclectic mix of the Hundred Islands in Pangasinan, the Chocolate Hills of Bohol, and the karst cliffs of Osmeña Peak in Badian. 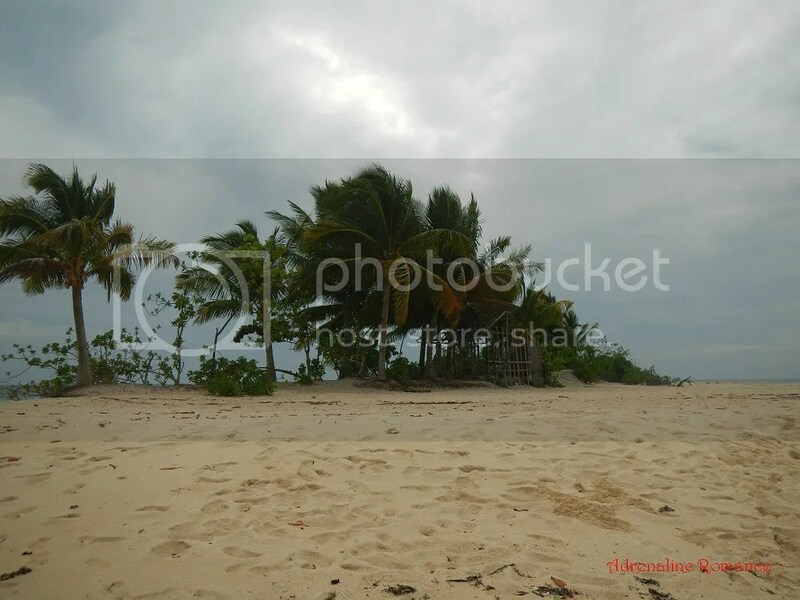 This is the sandy beach area of Boslon Island. 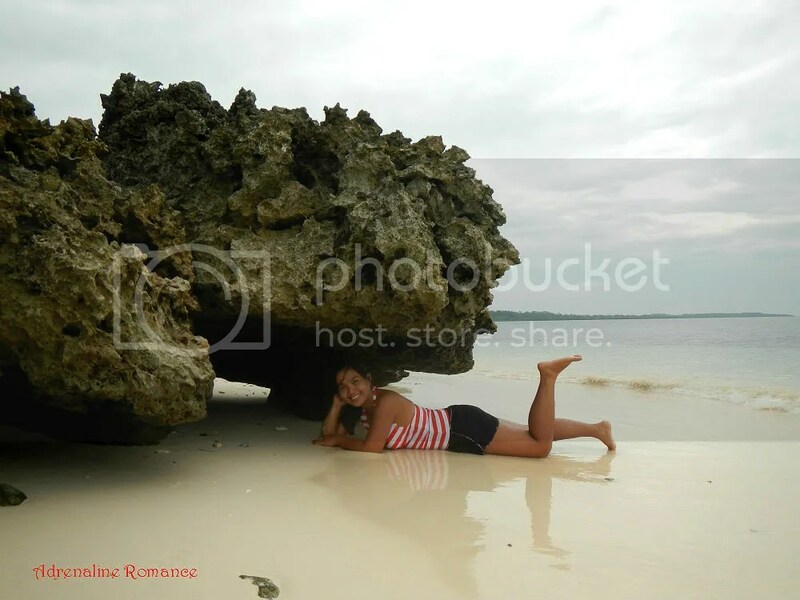 As you can tell from the photo below, it’s extremely difficult to resist jumping into the aquamarine water. Okay, we have these “nuptial” shots again. Wow! If Dodong has a DSLR, he might start a new career as a wedding photographer! 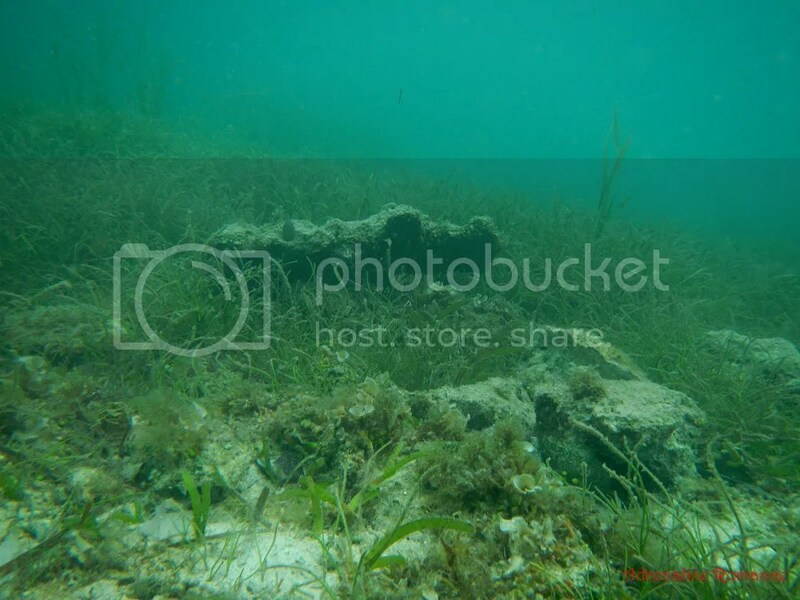 There’s an abundance of sea grass just a few yards from Boslon Island’s sandy shore. While we frolicked in the water, Dodong approached us and asked if they could leave us in Boslon Island for a little while to head to the mainland. The banca chartered by a group of tourists conked out, and ours was the only one big enough to accommodate 20 or so people. Always ready to give a helping hand, Sweetie and I readily said yes. 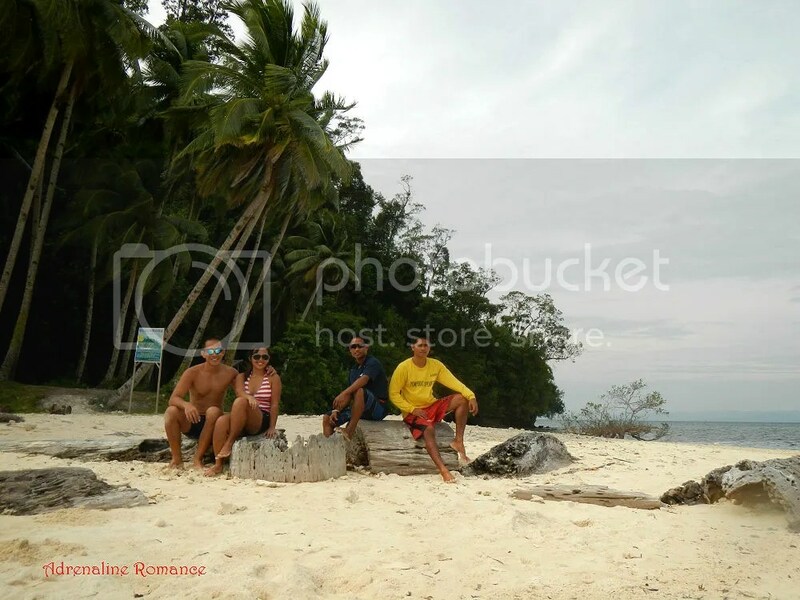 Thus, we had plenty of time to relax in Boslon Island’s beautiful beach and just enjoy each other’s company. 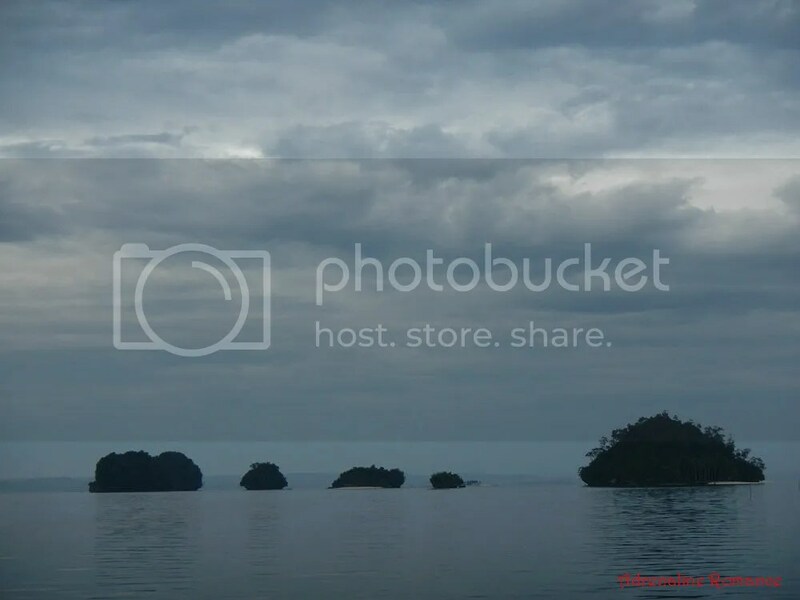 Behind us are the muffin-shaped Palangagan Cave Island and Palangagan Forest Island. 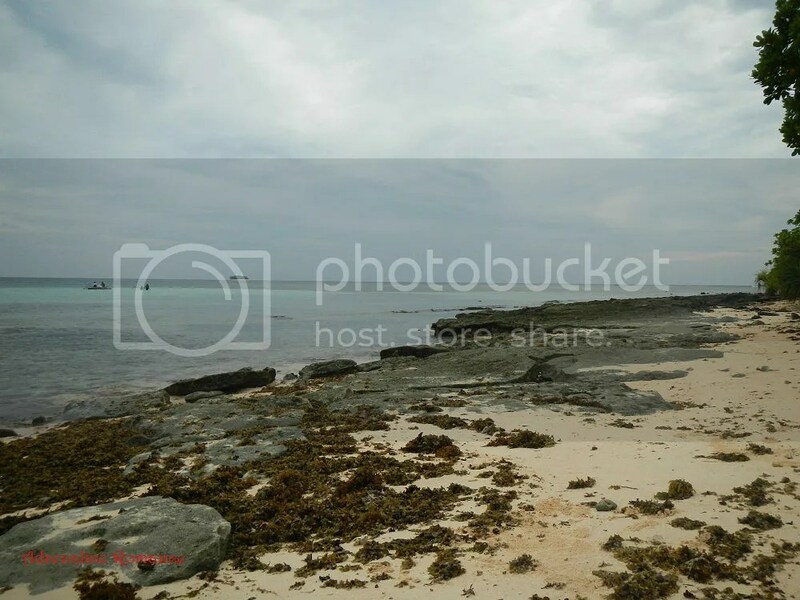 During low tide, one can walk through waist-deep water from Boslon to reach both promontories. All right, you know we just couldn’t resist it after seeing those magnificent crags. While waiting for our guide to return from the mainland, we practiced our rock climbing techniques by bouldering, or climbing short problems (routes or paths that a climber takes) without the aid of any climbing equipment. Go, Sweetie, go! If we’ve known prior to our trip that we’re going to a place that has excellent, high-quality rocks, we could have brought our climbing shoes and chalk bags. No shoes, chalk bags, or bouldering mats. But we still had a lot of fun without injuring ourselves. 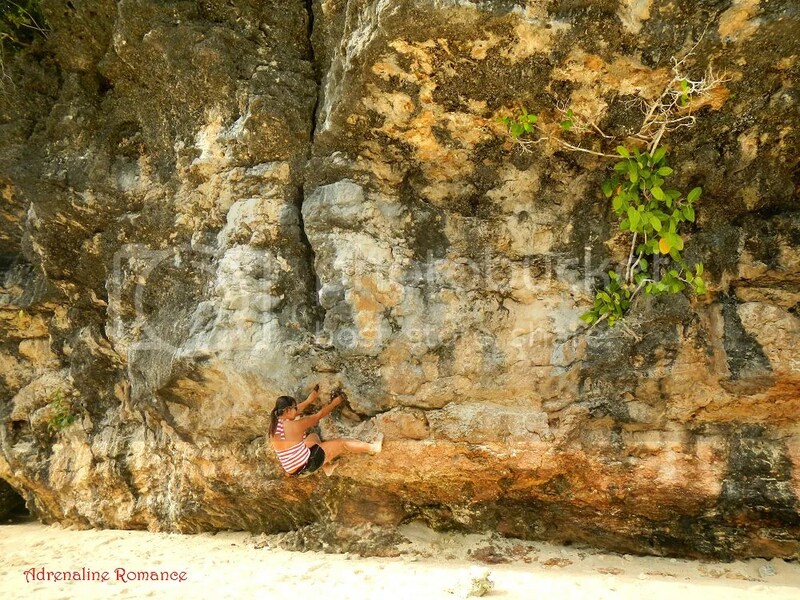 We hope the sport of rock climbing will be introduced in San Agustin. Boslon and most probably the other islands in Britania have really great, solid, high-quality rock which can take up bolts and hangers. Even if they’re not bolted, they are perfect areas for bouldering. We didn’t let Dodong relax when he came back. Hahaha! We told him to proceed to our next destination even before he fixed the boat’s anchor. Images of our last destination for the morning are constantly seen in guide books, postcards, posters, and banners that advertise tours around Britania. 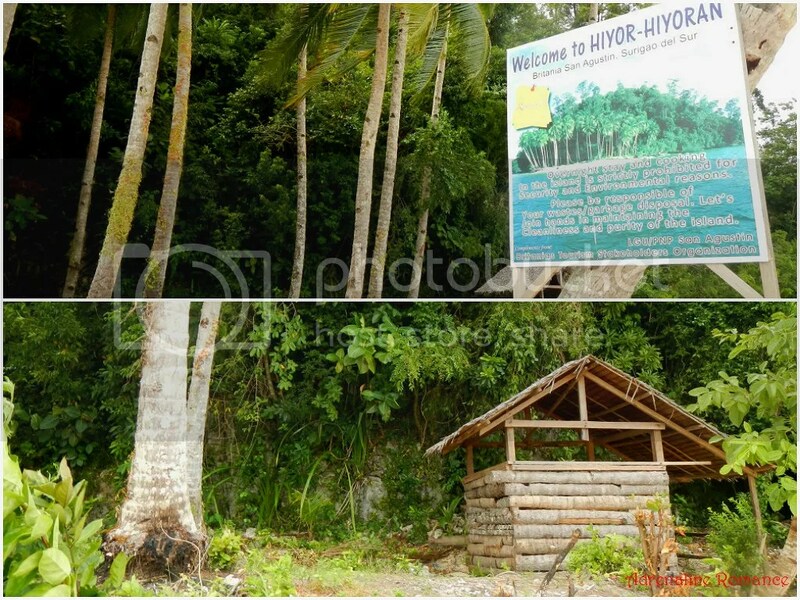 Hiyor-hiyoran Island is one of the bigger islands in Britania. 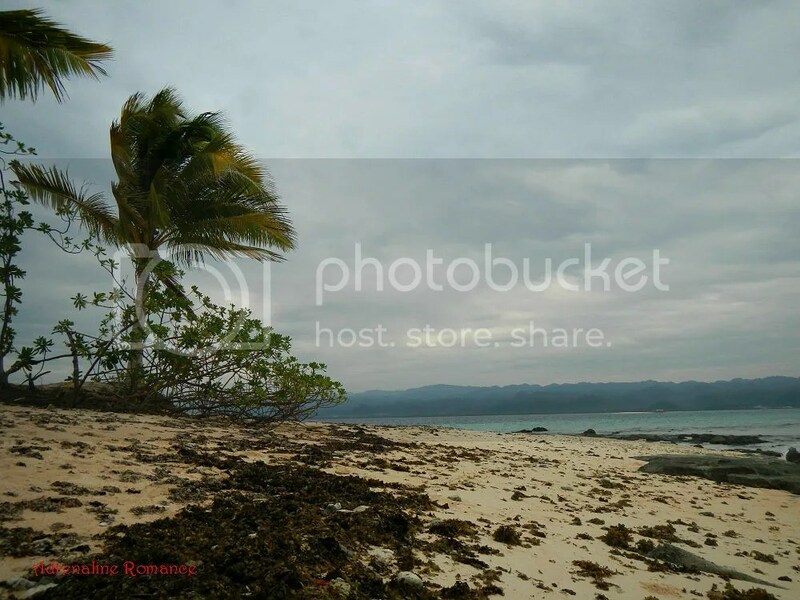 Just like Boslon, the island consists mostly of rocky shores, with a mere portion of it being a sandy beach. Because there were plenty of submerged rocks, we approached the beach area carefully. From the boat, we saw fishermen taking a break on the island. 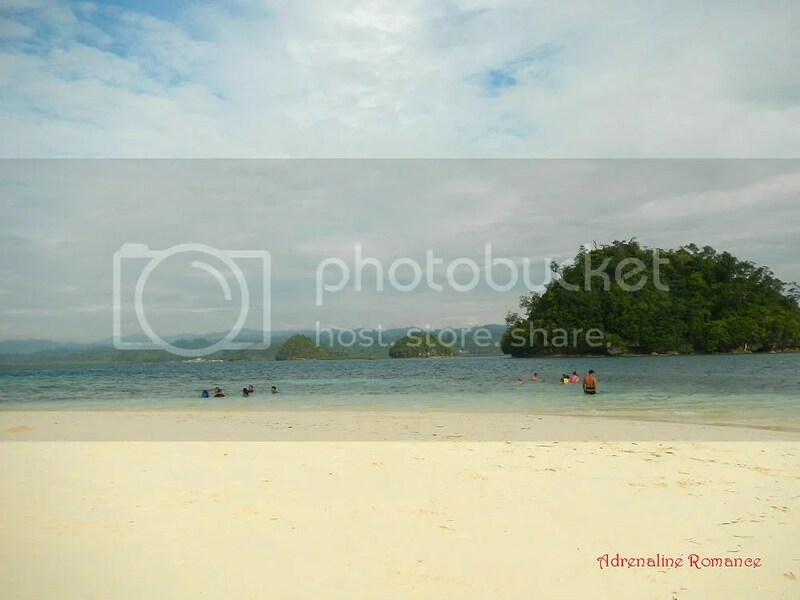 You may have seen photos in Surigao del Sur’s tourism posters, travel brochures, guide books, and other marketing materials that are similar to the one below. That’s because this is one of the best vantage points that perfectly encapsulates the beauty and serenity of Britania. Sweetie decided to explore Hiyor-hiyoran’s beach. If we had brought trekking shoes, we could have scaled or explored the innards of the island. Obey the rules, and help preserve Hiyor-hiyoran’s virgin beauty. No cooking, no overnight camping, no trash to be left behind. 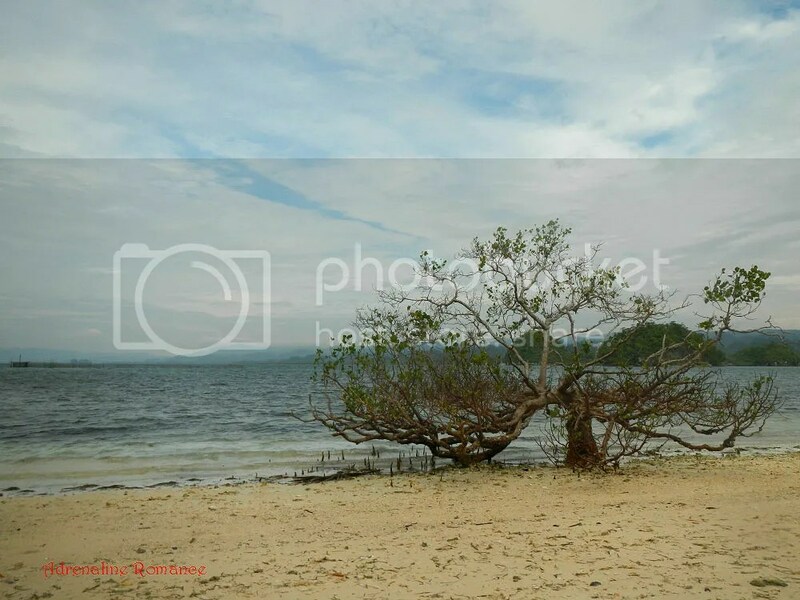 That log structure is an outpost that can be used by fishermen and Bantay Dagat personnel. A nice coconut grove provides shade from the hot sun. 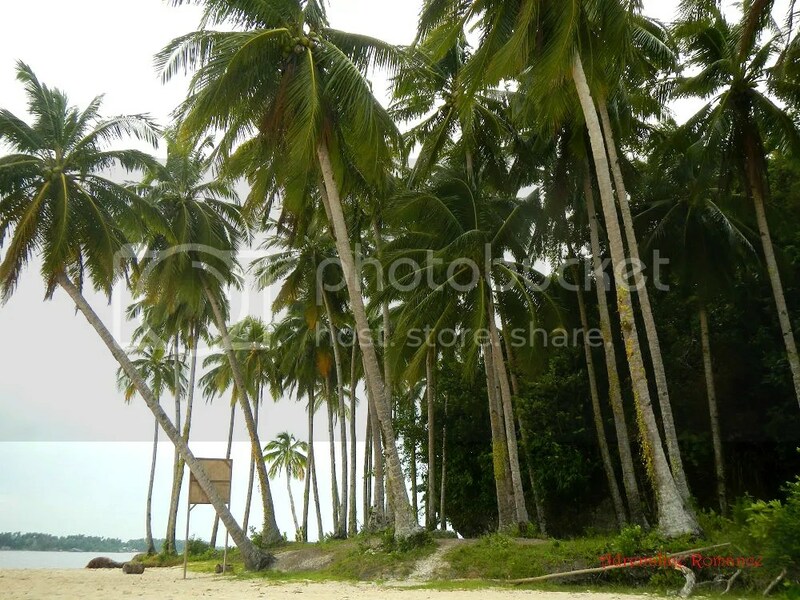 If you look closely, you’d see ubiquitous steps being hacked on the coconut trees’ trunks. That obviously means that those coconuts are meant to be picked. However, we’re not sure if and how you can order fresh coconuts here. A lonely mangrove guards Hiyor-hiyoran like an immortal sentinel. Before calling it the end of an awesome island hopping adventure, Sweetie took a seat to admire and drink in Britania’s splendor. It would be quite awhile before we’ll return here and explore the other islands in the bay. We returned to La Entrada Resort after more than three hours of visiting (and temporarily owning) a bunch of tropical paradises. Our simple yet yummy breakfast was ready and waiting for us, a fitting reward for a great early-morning adventure. After a 10-minute habal-habal ride, we were back on the highway, waiting for a bus or v-hire that will take us to Tandag City. 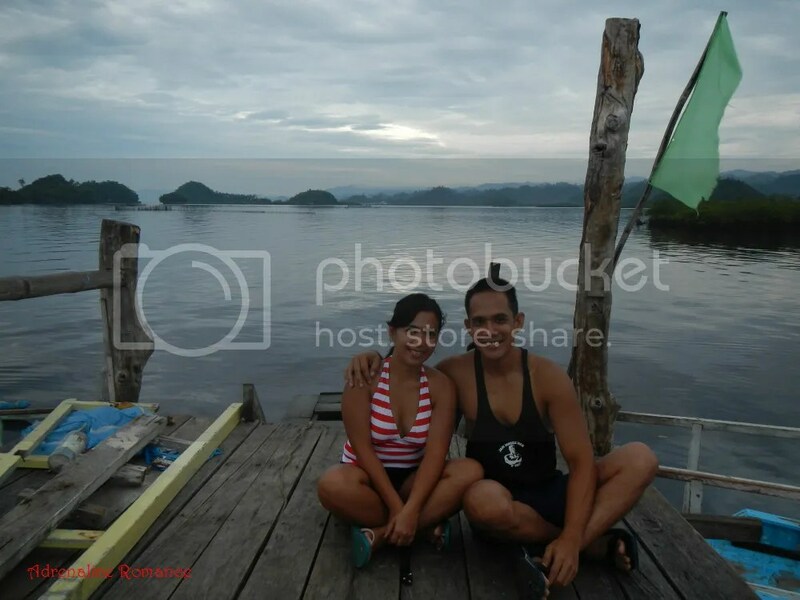 Before continuing with another blog post of our Caraga Region adventure, we’d like to share something that will make you proud, burst out in laughter, or shake your head in disbelief. And that’s because you can find it only in the Philippines. We hailed a v-hire that will take us to Tandag City. Nothing unusual, right? Until we passed by this contraption, a skylab in full operation! 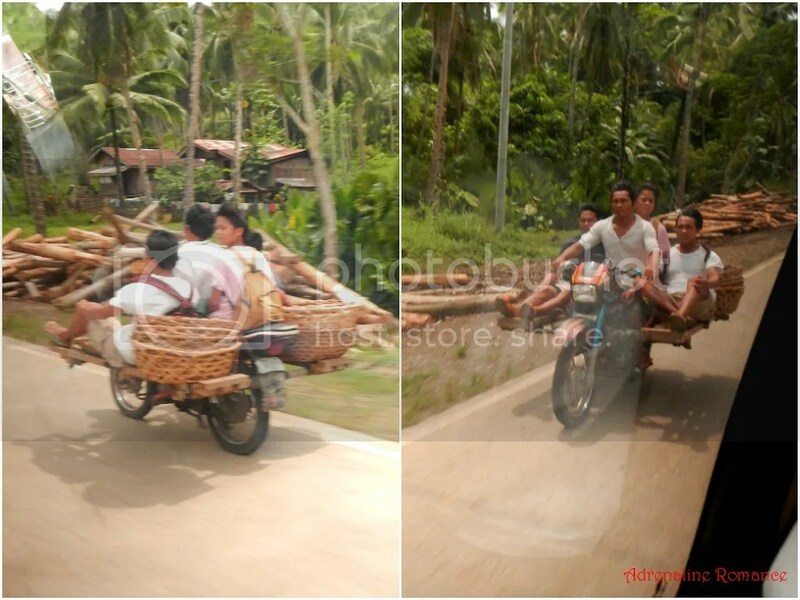 As we mentioned earlier, it’s a perfect example of Filipino ingenuity and creativity. Or perhaps, utmost desperation to earn money or to bridge the inadequacies of the Philippine government to provide safe and reliable transportation. Is it safe to ride the skylab? We would like to think so. Riding one should be a hell of an adventure, an experience of a lifetime—at least for us. 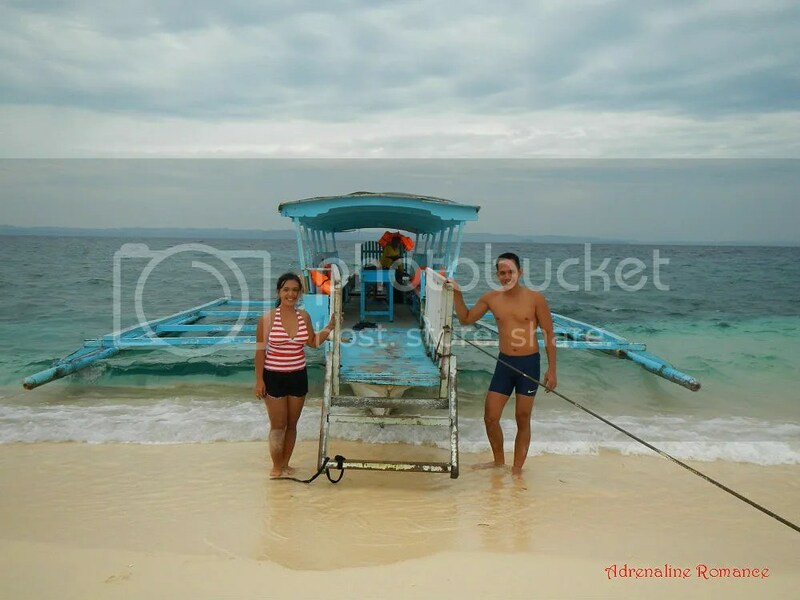 Thank you to our guide and impromptu photographer Dodong (the lad wearing a blue shirt) and his boatman. The Britania Group of Islands is truly a very promising, amazing destination. For a few hours, we experienced what it is like to have an island all for ourselves. We were enthralled by the gentle charm of these rocky gems. We re-energized our bodies with sun, sand and sea. We sharpened a few techniques required in perfecting our primary passion. And yet, we barely scratched the surface during our three-hour adventure. Who knows what other wonders the Britania Islands are holding secret, waiting to be discovered? 1. To ensure a hassle-free adventure and utmost convenience, we strongly recommend arranging your island hopping trip with the resort you’re staying in. In that way, you don’t have to waste your time and effort in hunting for guides and boats. We arranged our Britania Island hopping adventures through La Entrada. To contact the resort, check out their website or their facebook page. 2. If you have not booked an Island hopping tour or if you opt to do it DIY, visit the tourism office at Britania for assistance in securing a guide. Ask any local for directions, and they’ll be happy to take you there. 4. Order your breakfast the night before your island hopping tour and tell the receptionist what time you want it served so it would still be fresh and hot. 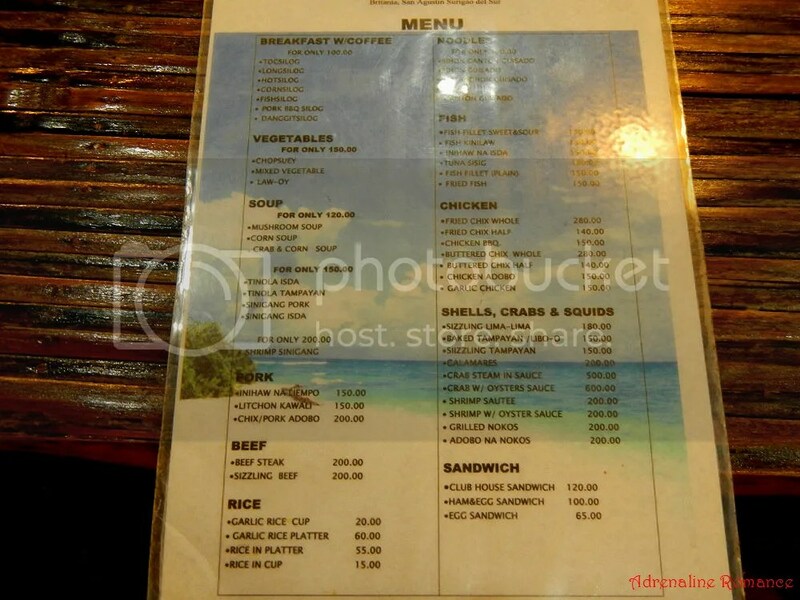 During our stay, we wanted our breakfast served at 9:00 AM after our island hopping adventure. 5. If you have some money to spare (if we recall correctly, around P200), you can arrange for the resort to have your breakfast delivered to you! For instance, you may want to spend more time in Boslon Island. Your guide can go back to the resort (leaving you temporarily stranded in the island of your choice), get your order, and deliver your meal to you. Great! Breakfast in paradise! 7. You are not required to give your guide a tip. However, Dodong was extremely friendly and exceptional, so he deserves a tip from us. 8. 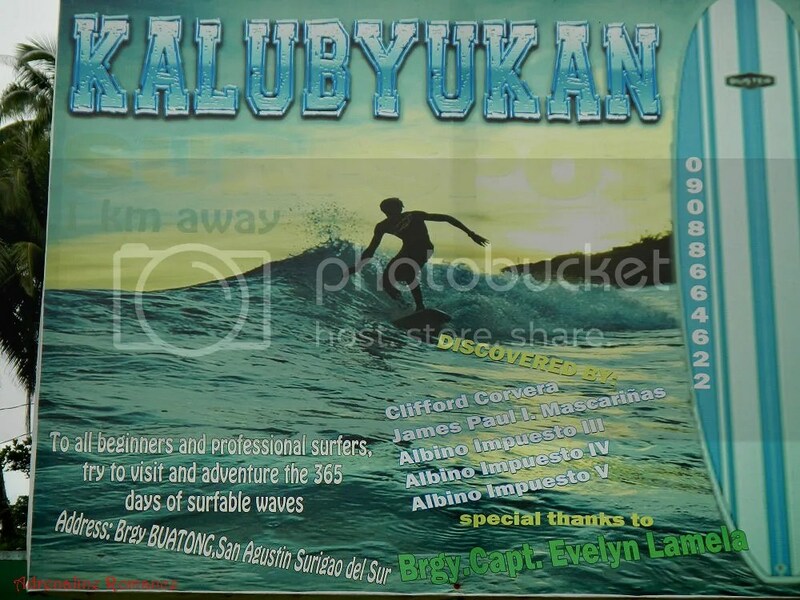 We didn’t know that San Agustin has a venue for surfing until we saw this board in the highway. 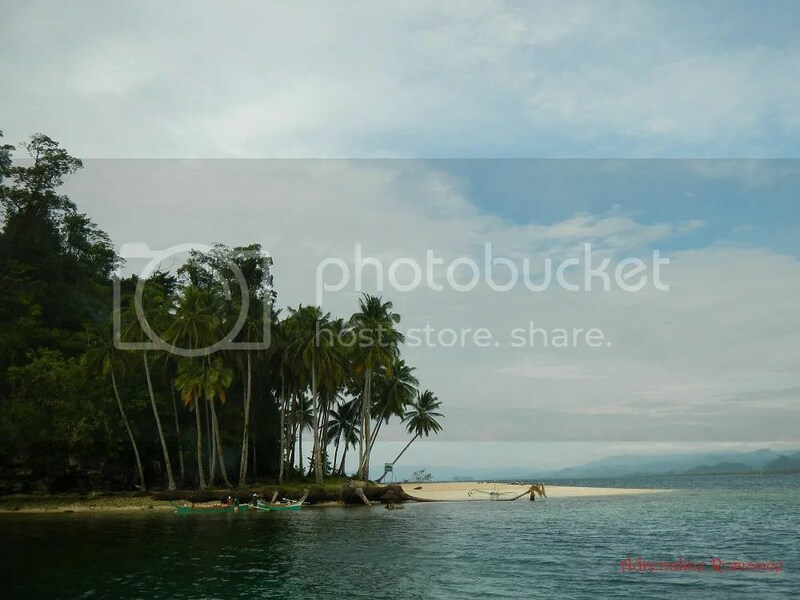 A cheaper alternative to Siargao, perhaps? If you have plenty of time and you’d like to have a taste of surfing, check out the photo below. Hehe! As in! Ganahan kaau siya sige ug picture namo ni Sheila. Sige cya suggest ug mga nuptial poses. Can we ask the contact number po ni Mr. Dodong? Thanks! Unfortunately, we don’t have Dodong’s number. But you don’t need to worry. Just ask your resort/hotel/accommodation to provide you a guide/boatman. In fact, in our case, the resort which we booked in (La Entrada) was the one who provided Dodong to us. Wow, gorgeous islands. So glad they’re environmentally conscious there, keeping the islands in pristine conditions. You guys are so lucky to be there. 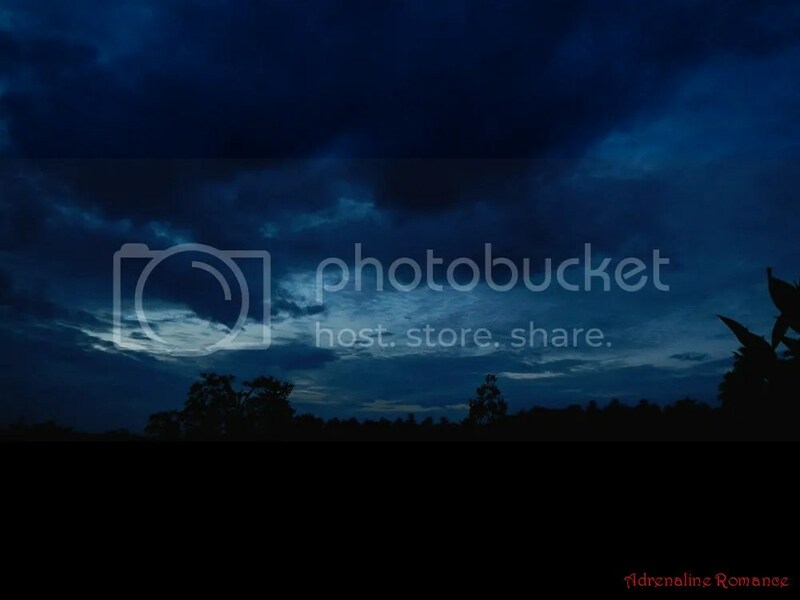 Thank you for sharing your beautiful pictures. Indeed, they are! 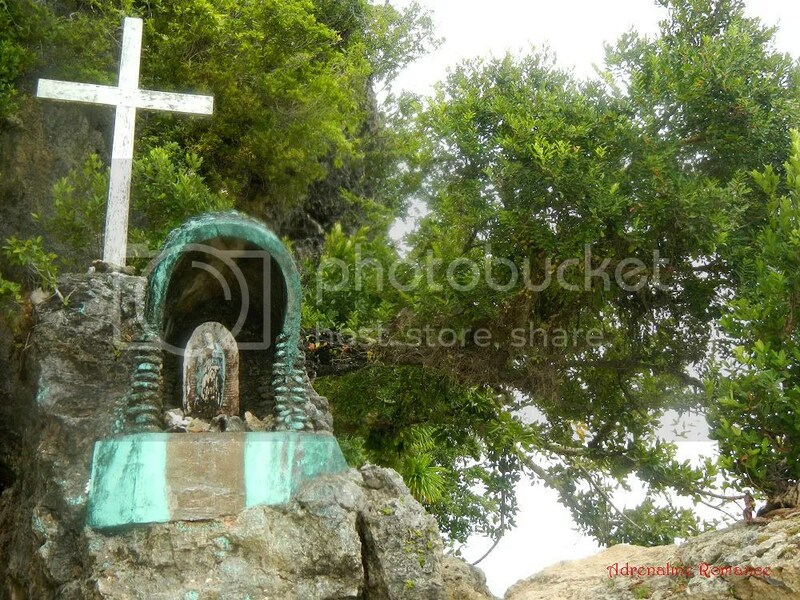 San Agustin’s LGU did a spectacular job in keeping them pristine even Britania is fast becoming a popular tourist spot. You should visit Britania if you have the chance; the experience is pretty awesome. 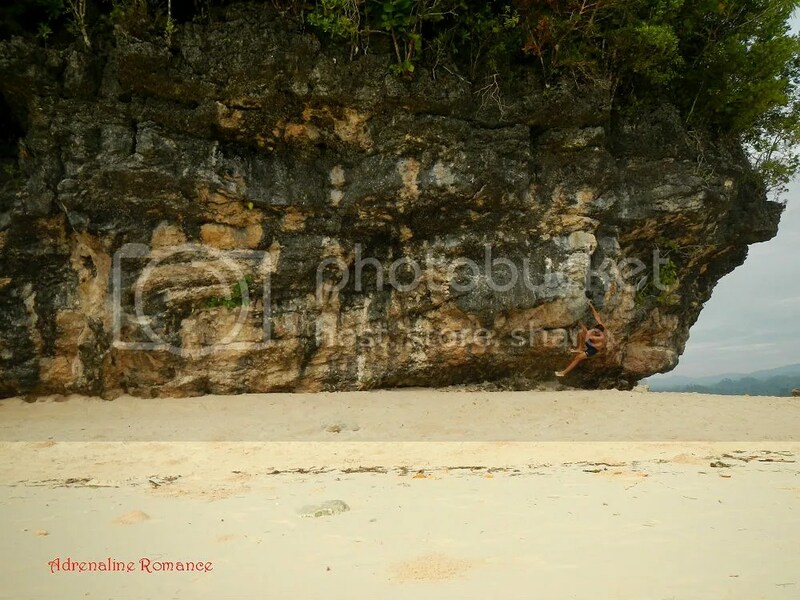 We had planned on visiting Siargao since my husband surfs. This is why we live on Kauai. It’s good to know surfing is available there too. Do you think there are other available mode of transportation going to La Entrada Resort? Please email me if you like. Thanks a bunch. That’s cool! Sheila and I have yet to learn surfing, so we’re planning to visit Siargao next year to try out the sport. 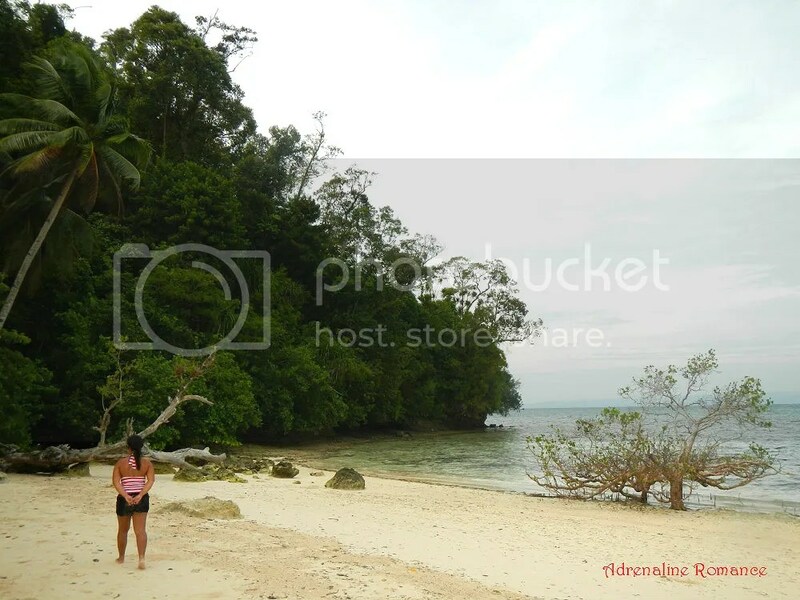 Perhaps we’ll also visit Lanuza and Cantilan in Surigao del Sur, which are cheaper alternatives to Siargao. We believe there are other modes of transportation that can get you to La Entrada. In fact, we saw a few vans hauling guests and tourists at the resort. Thus, we believe you can hire a van if you don’t want to ride the habal-habal. The problem is that we don’t have any idea or detail about hiring one. We suggest getting in touch with the resort and letting them arrange your transportation for you. 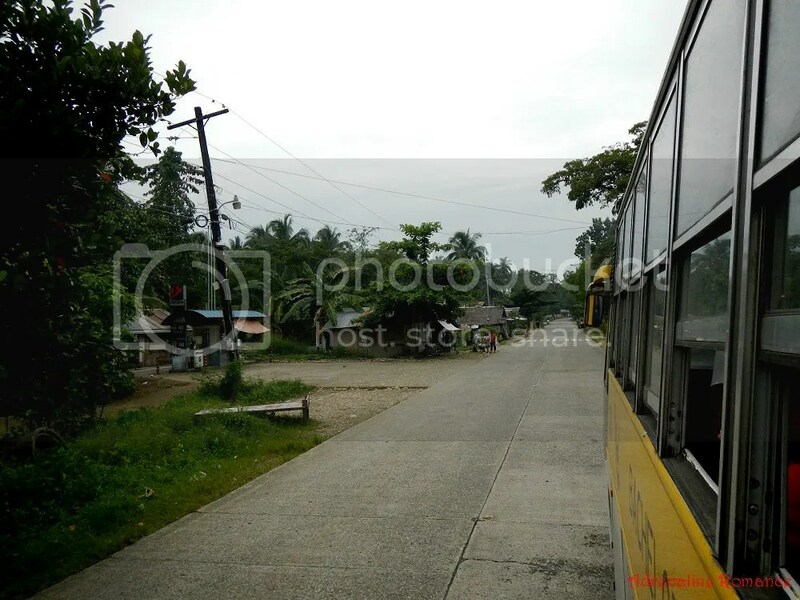 There are no taxis or PUJs that ply this remote stretch of Mindanao. The only public transportation available here are buses, v-hires (vans), and motorcycles. Nindot kaayo bai! 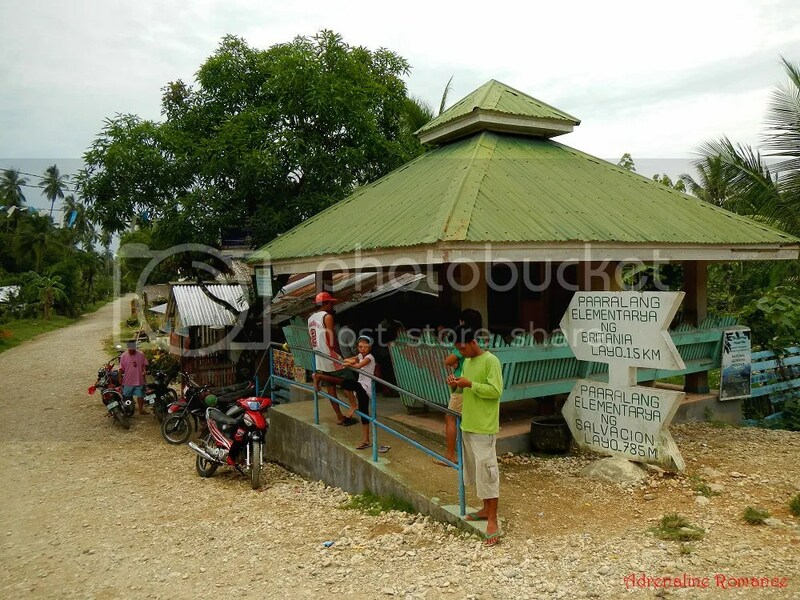 Hinaot maka-bisita pud mi sa ako wife diring lugara. Thank you! We do urge you to visit Britania, especially if you love beaches and island hopping. We’re sure you and your wife will love it there. I love the pictures! Good job. The article is so informative and lovely to read. Thank you so much for sharing this. Thank you too for taking the time to check out our adventure. Stay tuned for more! Oh, the place truly is romantic. If we had a choice, we would have a candle-lit dinner in one of the islands. Hehehe! Thanks for sharing all these wonderful travel tips! I’m going to follow your photos! You’re welcome, and thank you very much for your compliment. Please do visit these places—they are superb! You article is very helpful. Thanks a lot!!! Thank you very much! We are glad to know that this article was useful to you.